This recipe is my mom’s recipe and I can’t even describe to you how good it is. 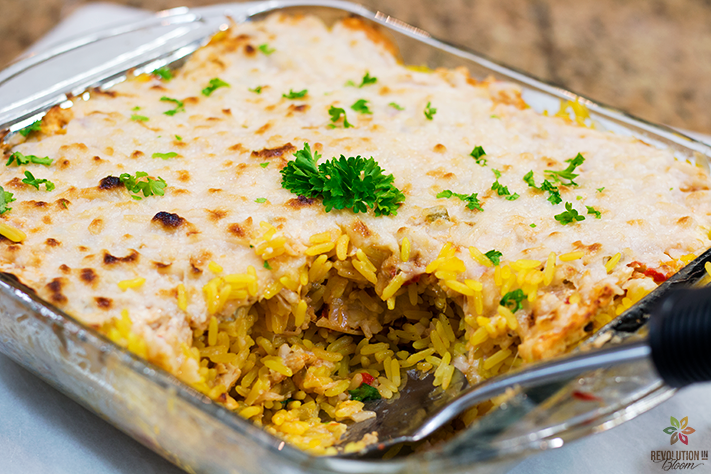 Arroz Imperial is essentially the Cuban lasagna. It’s rice casserole dish layered with “chick’n”, cheeses, and yellow rice. For the chick’n layer I used jack fruit canned in brine and Gardein chicken scallopini. With a few other ingredients, this is turned into a Cuban style chick’n fricassee. It’s layered with some vegan cream cheese and vegan mozzarella shreds in between yellow rice. For Cuban families, this dish is a staple at parties and big events. Usually served alongside some salad and fried sweet plantains. YUM! So, I hope you give this simple and yet delicious recipe a try. Check out the full video tutorial *in spanish* at the RiB Youtube Channel. While you’re there make sure to like+share+SUBSCRIBE! Arroz Imperial is the lasagna of Cuban households. A must try dish! Prepare your yellow rice by adding the rice ingredients to an electric rice maker or electric pressure cooker (I used the Instant Pot) and cook according to device instructions. While rice cooks, prepare your chick'n fricassee by adding your onion, green and red bell pepper, garlic, oregano, bay leaf, oil, and tomato puree to a medium sauce pot and set on medium heat. Stir together to combine. Next, take your rinsed and drained jack fruit and shred into your pot with your hands. It should resemble pulled chicken or pork. You can cut off the triangle ends of the quartered jack fruit and discard or dice into smaller pieces and add it in as well. Then, take defrosted scallopini chick'n and break apart into small pieces and toss into your pot. Mix all of the ingredients in your pot together to combine. Add to this mixture your water, cooking wine, bouillon cube, and salt to taste. Stir again and allow to simmer for about 15-20 minutes in your pot, stirring occasionally. Liquid should reduce by half. Once chick'n and rice are done, add about 2 cups of rice to a square 9 inch baking dish. Press it evenly into the bottom of the dish and add about 1 1/2 cups of your chick'n fricassee. Spread chick'n over top of rice. The add 1/2 cup of cream cheese over your chick'n and spread evenly. Then add a layer of 1 cup of mozzarella and spread evenly. Then add another 2 1/2 cups of rice over this layer, spread evenly, and repeat the chick'n and cheese layering process again. You should end with a layer of mozzarella shreds over the top. Cover your baking dish with aluminum foil and bake for 10 min. Then uncover dish and set oven to broil and melt/brown cheese over the top for about 1-2 min, being careful to watch dish as cheese may burn. Once dish is done, let sit for 10 min before serving. ENJOY!